Ruth Rendely, co-founder (with a Seraph) of the Seraphim Blueprint,resides with her husband in the Blue Ridge Mountains of Western North Carolina. She actively handles international events and develops new courses related to the Blueprint. 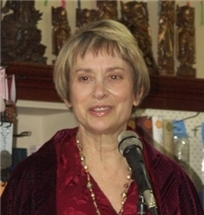 Her book Seraphim Blueprint: The Power of Angel Healing was published in 2007. To contact her use the form on the Contact page of this website. Suggestions for expanding the reach of the Seraphim Blueprint are always welcome.